Description: Remember the marble game we used to play in our childhood. 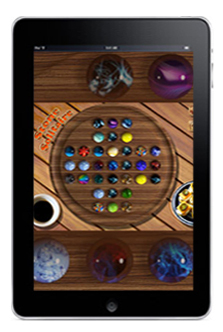 We have come up with its modified version in the form of an ipad application known as Stone Solitaire. This game has a circular board with 33 holes and 32 marbles placed over the holes. The target of this strategy game is to remove as many marbles as possible, by jumping one marble over another, either horizontally or vertically. In the end, one can create a best record by removing 31 marbles from the board in minimum time. A Fun game with high quality sound and animation effects. Player can choose different board textures to play. High score to see fastest times for each puzzle.